Pietro Grocco , born from a family of humble origins, as a child, distinguished himself for his ingenuity and his desire to learn. Thanks to the help of a priest uncle, an unspeakable dearth of his family and with the proceeds of the lessons he gave to his companions, he was able, in his early twenties, to graduate in medicine at University of Pavia1, where he also received the doctorate. Later he attended the school of Jean-Martin Charcot in Paris and Rosenthal's clinic in Vienna. He was an assistant at the Institute of Clinical Medicine of Pavia University and at age of 27 he obtained a teaching qualification in propaedeutic. 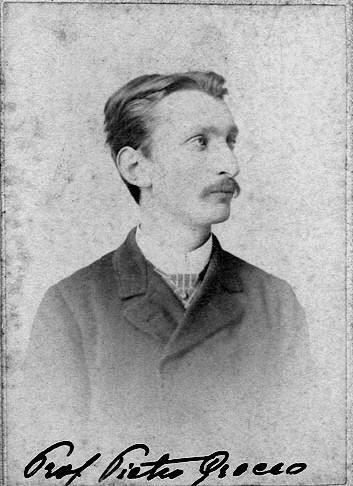 Then he became Professor of Clinical Medicine and taught at the University of Perugia (1884-1888), in Pisa (1888-1892) and finally in Florence (from 1892 to death)2. He founded the anti-rabies institute dedicated to him in the Tuscany Province. Hereafter he was credited with the direction of Montecatini Terme, the establishment still named after him3. He became friend of Antonio Morbini and Giuseppe Verdi, becoming his doctor during his last days of life. In 1905 he was appointed senator. After having diagnosed himself with tuberculosis, he moved to Courmayeur in hopes of being able to heal. He died in the same town. He is remembered as an innovator of semeiological approaches, and for the discovery of new pathologies such as the tubercolous pseudo-rheumathic syndrome. Characterized by a good and loyal character, he had a mild heart that allowed him to gain the trust of many. Despite the success and fame remained loyal to the simplicity, sobriety and sense of work that had characterized his youth. He invested all his savings in the agrarian culture buying vacant lots and turning them into experimental agricultural laboratories .He was interested in the sanitary and ecomomic protection of peasants, in their intellectual and professional education4. 1. Senato del Regno, Atti parlamentari. Discussioni, 22 marzo 1916, Bergamasco.